A sleek silhouette is both chic and sophisticated, while the lushness of plush foam cushioning creates cloudlike comfort in the Harper Sofa, a true example of simple luxury. 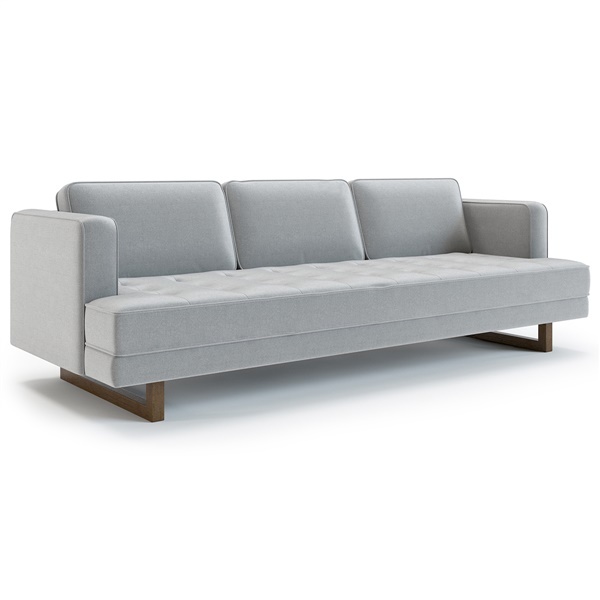 Crafted to last of quality materials, and available in a rainbow of heathered fabric upholstery shades ranging from understated to exciting--and each accented with meticulously tufted details--the Harper Sofa slides with ease into all manner of aesthetics, from the ultra modern to the mid-century motif. Versatile modern style works well with a variety of decor schemes. A layer of memory foam sits on top of padded cushion to provide extra comfort. Sleek base is expertly crafted of stable metal. Available in a variety of color options to meet your decor needs. Beautiful in evening blue! Glad I got my hands on a blue sofa that actually blends in with my other furniture! Stunning in evening blue - a bold color to work with as a sofa but paired with white and silver decor, it stands out in a great way! I've had this couch for about 2 months. I like it very much, I just don't know that love would be the right word. The color is great, set up was great, and it fits perfectly in my small apartment but could also be a good size for bigger spaces. I do love the bench style cushion, makes it easy to lay down without sinking into the wrong places. I just wish it had some softness to it - thats my biggest complaint. Just not nearly as comfortable as I had hoped. Maybe it will soften a bit over time. If you're looking for something on the stiffer side, it is otherwise a nice couch. Went with evening blue. Color is beautiful. Fits great in my sitting area. Delivery was fast. Love inmod!!! The legs on this sofa are super unique. They give a great modern touch to an already modern sofa. Got it in the blue color and it is gorgeous. Fantastic purchase. Very very happy and love Inmod. I was looking for a neutral and found this in light gray. Very happy with the color and size. Delivery was simple and it arrived in perfect condition. The back cushions are removable, but the bottom cushion is not. Each sitting area on this sofa is rated for up to 300 lbs.